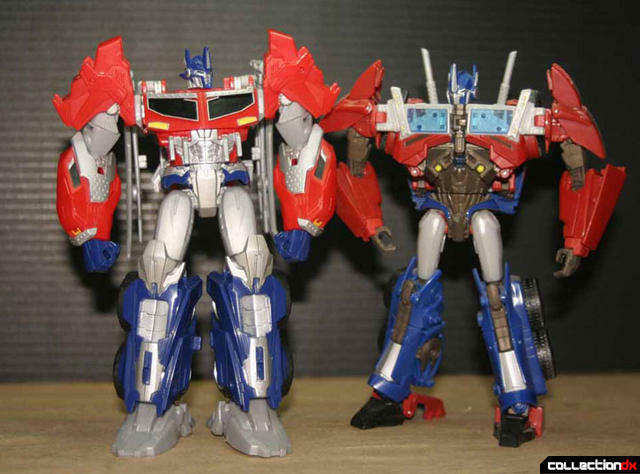 Comparing the CGI models of Optimus Prime (from the TV show and artwork from the side of the packaging) to the toy itself, one can see where Hasbro was tasked with creating a figure according to an aesthetic theme long before the show was ready for broadcast. 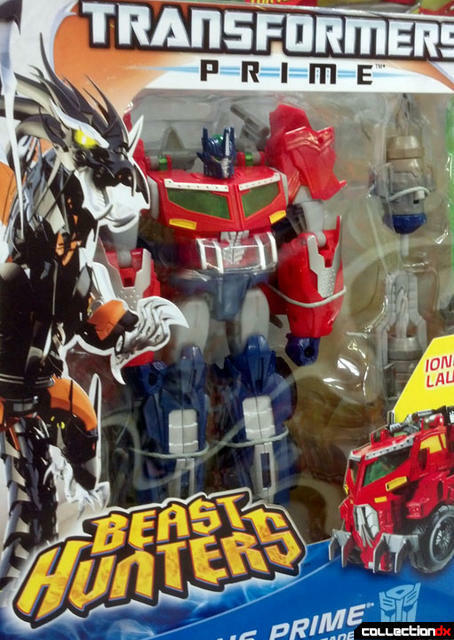 The pressing concern with the figure is… Where is all of the missing color!? 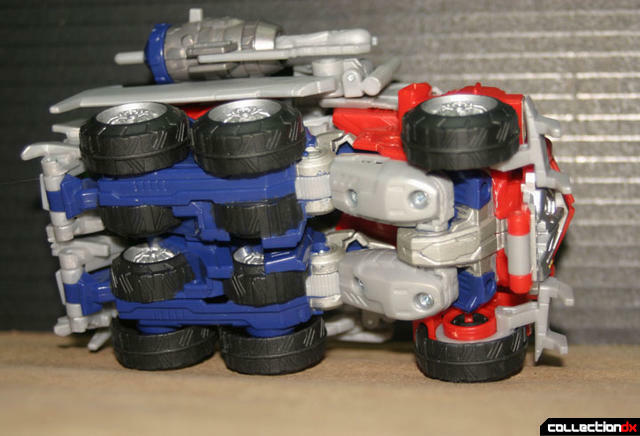 Prime’s vehicle mode wheels are stored on the backs of his legs in robot mode, and the toy shows this with a molded set of wheels hidden behind the real ones. 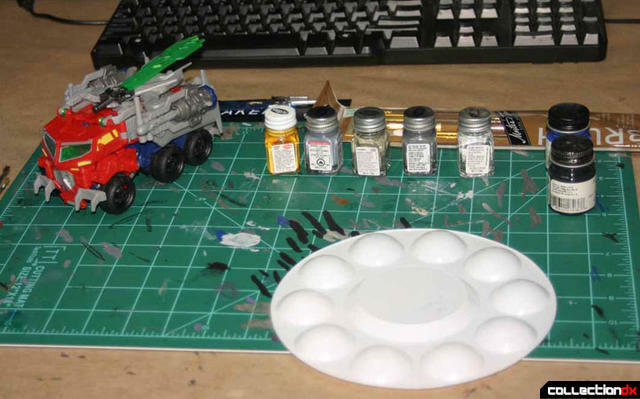 These were a simple fix using Testors Model Master ‘Flat Black’ acrylic paint for the tires followed by a touch of Testors (traditional) ‘Silver’ enamel for the wheel hubs. 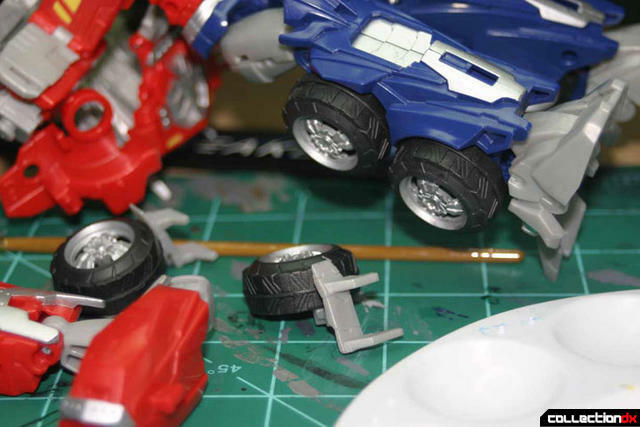 … Yes, I painted all of the rims. 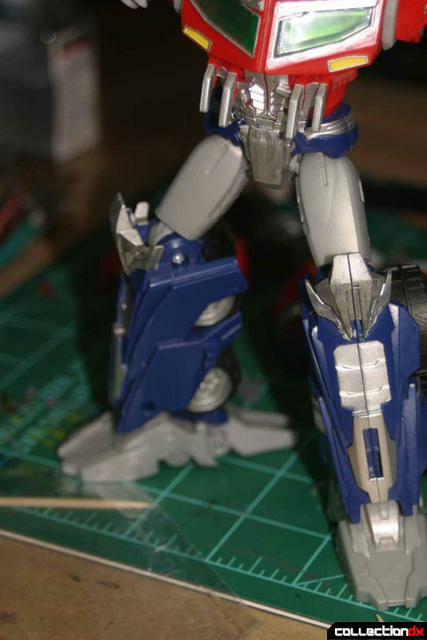 On Optimus Prime’s waist, knee guards, neck, and joints, I used Testors ‘Steel’ enamel to recreate the design’s third metallic tone. 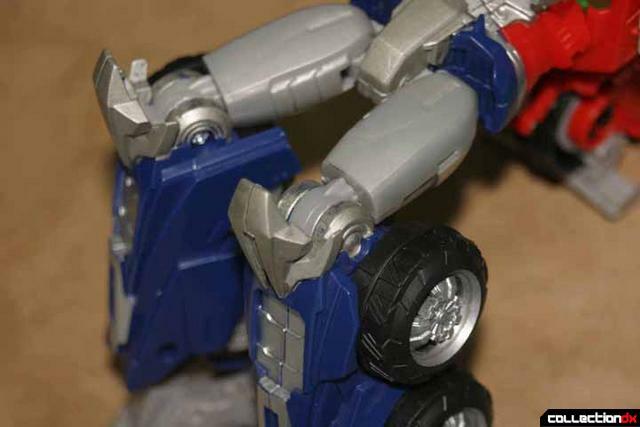 Some of the early reviews for the figure have shown there is a recurring production flaw of an unsightly scar to run across Optimus Prime’s face. 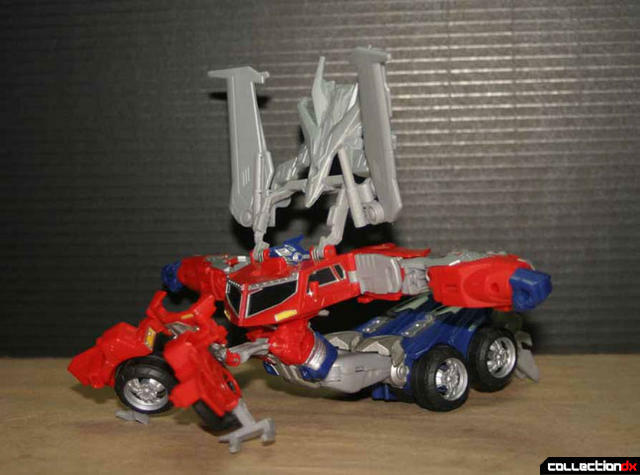 This seems to have only happened in the first wave of the figure, as some of the units seen on store shelves have this corrected. 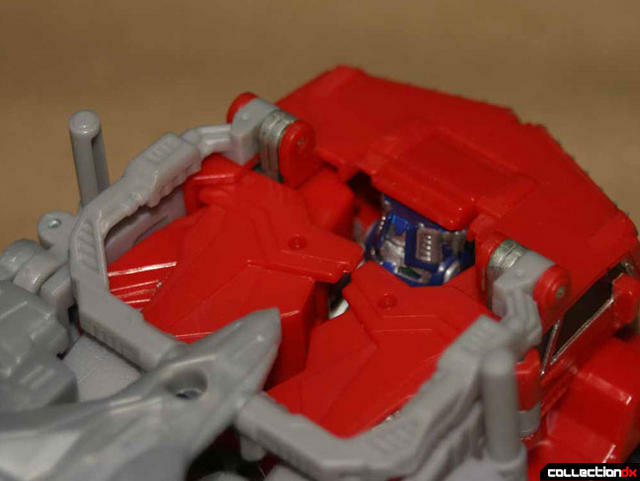 In order to fix this, I sanded down the figure’s face with a fine (200-300 grit) sanding pick and painted back over it with silver enamel along with the vents and sprockets on the sides of the helmet. 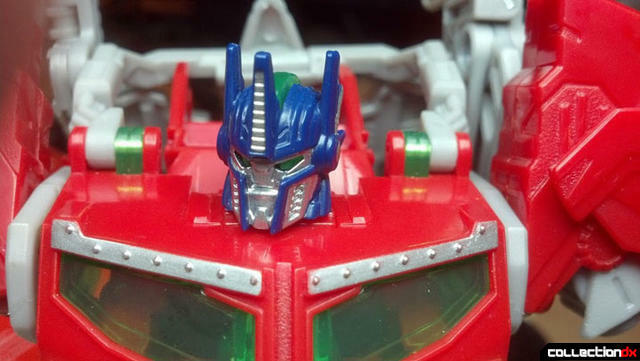 There was some misconception in Prime’s face design with what appeared to be a nose; a facial feature missing from the series’ robot designs in general. 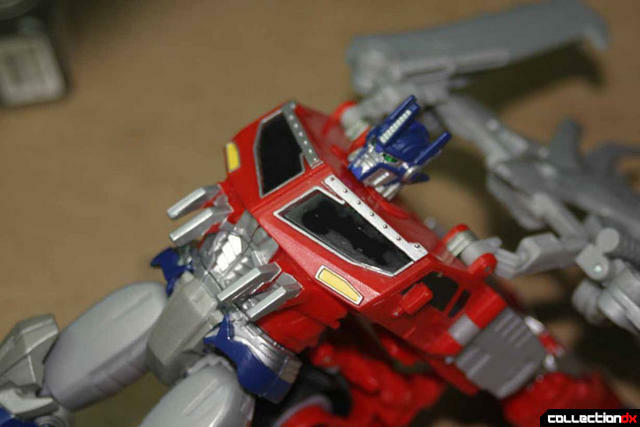 Watching the animation model from the show, it is clear we have been deceived by mass production airbrushing. 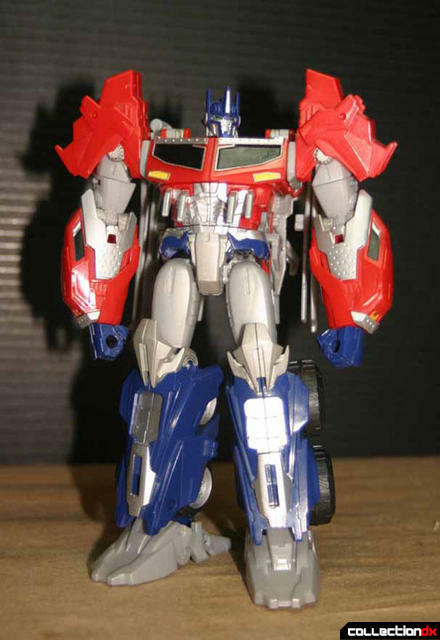 The nose is actually the point of Optimus’ helmet. 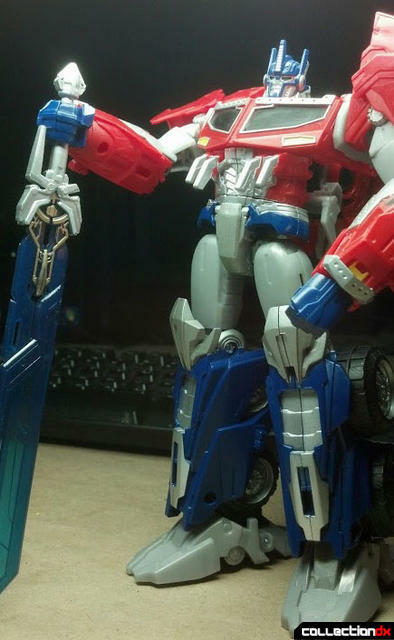 To fix this, one can either strip the paint off of Prime’s face with some solvent, OR do as I did and just touch it up with the right mix of blue paint. 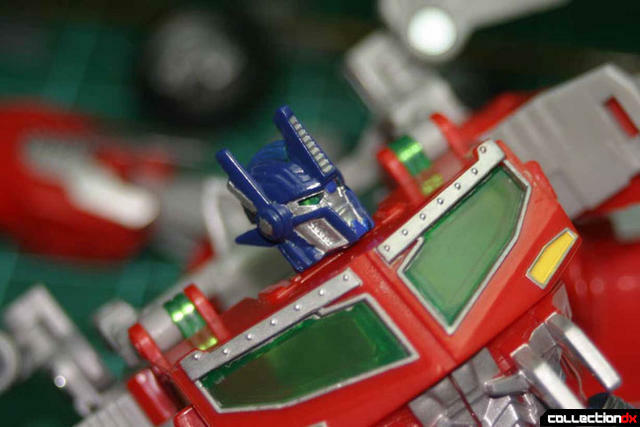 Testors brand ‘Model Master Acryl’ Druid Blue paint is what I used here and also applied to Optimus’ chin strap as well as for coloring over the clear green (light piping) plastic piece of Optimus’ Mohawk. 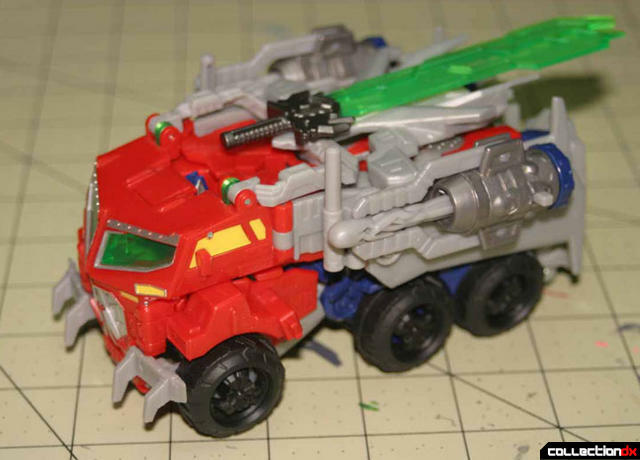 My paint work was not just exclusive to Optimus’ robot mode as I also made some corrections to the vehicle mode. 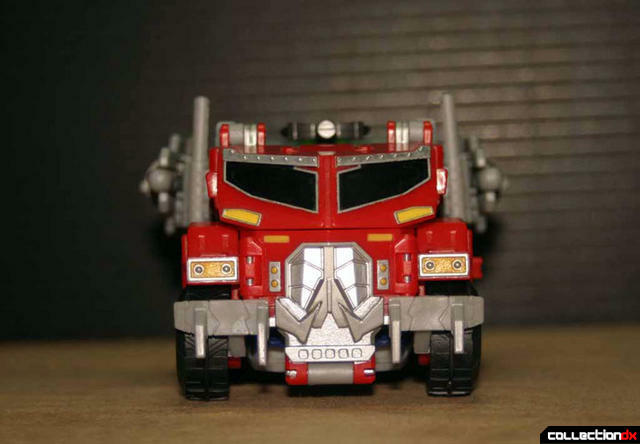 Like the robot mode’s chest, the front bumper and grill needed to be filled in and touched up along the airbrushed edges. The front headlights were unpainted and needed to be filled in with some yellow paint and later framed in with silver enamel. 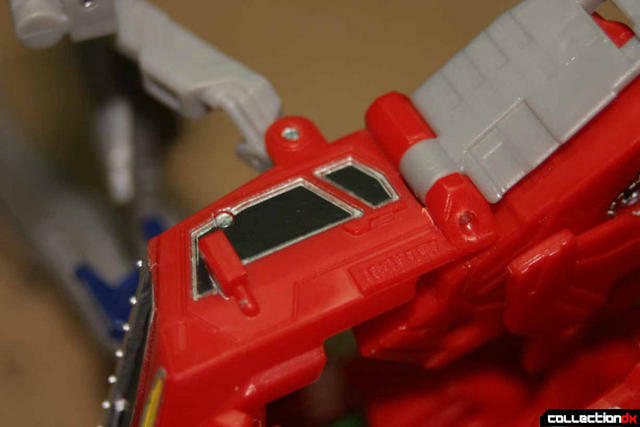 While I’m sure Hasbro had an interesting idea in mind with the clear green plastic for the Star Saber, using it for Optimus’ windshield was very uneven against the bright yellow painted side view windows. This was an obvious change using ‘Semi-Gloss Black’ acrylic paint and a touch of the Steel enamel to cover the clear green plastic coming over the shoulder. 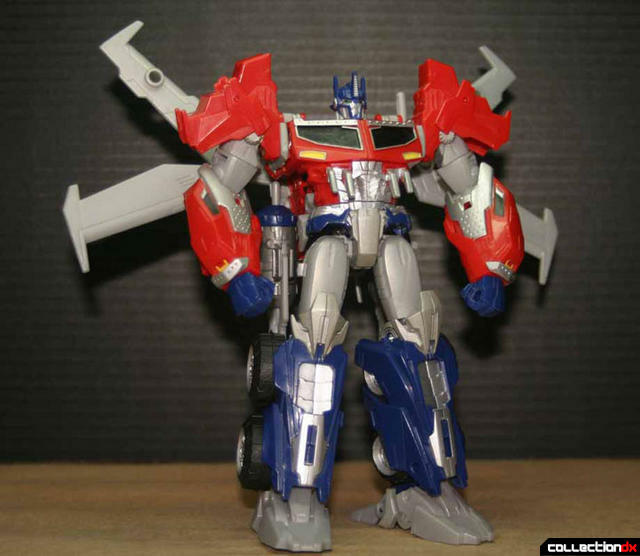 In terms of design, it steps away from the “Animated” inspired proportions of his original body and endows Optimus with the physique more akin to the character of the same name from the “War for Cybertron” video game (which Hasbro uses as the ‘official’ canon of the Aligned Universe). 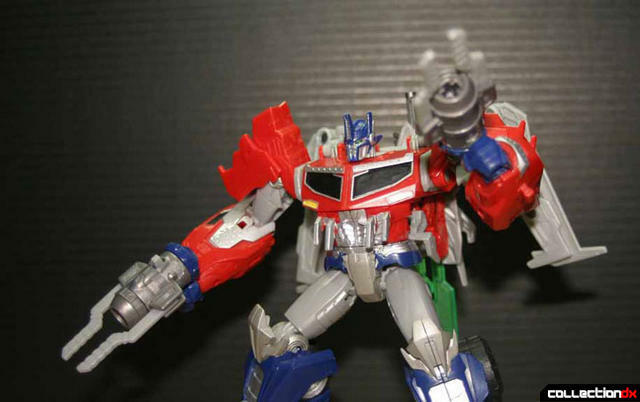 Prime’s robot mode is a solid action figure geared for the younger ‘Prime’ audiences to enjoy and is just as much fun for older fans too. 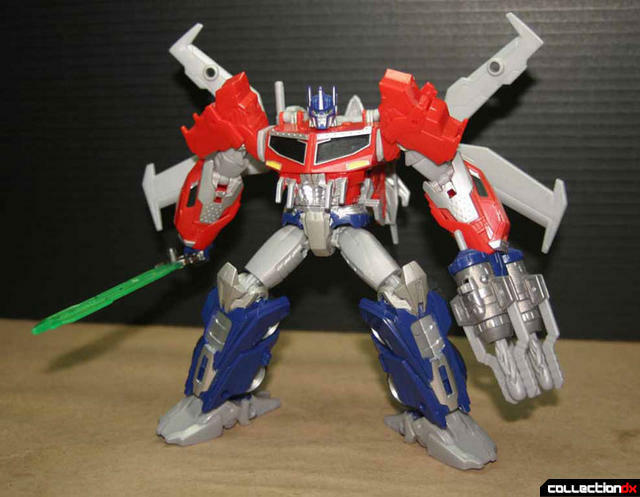 Optimus is well articulated using swivel joints and basic hinges in the limbs. 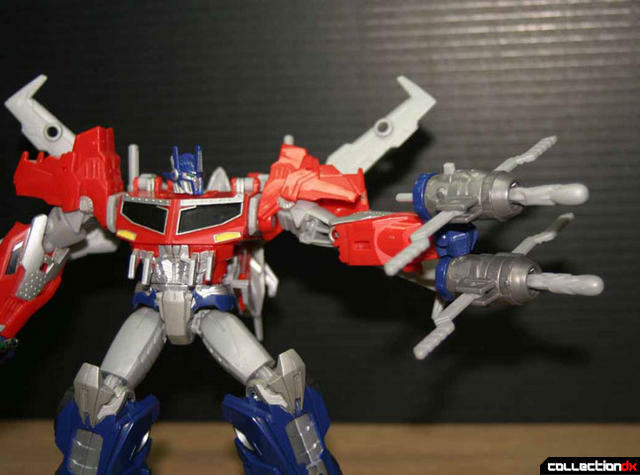 As part of Optimus’ upgrade, the figure features a built in flight pack with fold out wings loosely inspired by his “Dark of the Moon” counterpart. 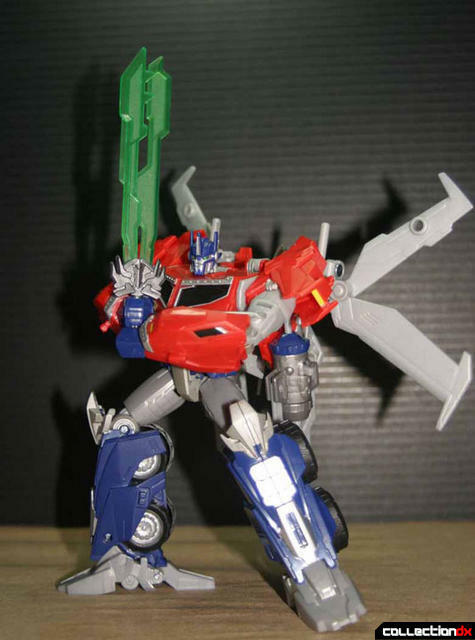 Although the sword’s design dulls in comparison to its source material, the sword’s 5mm peg handle is long enough to allow both hands to grasp it at once. 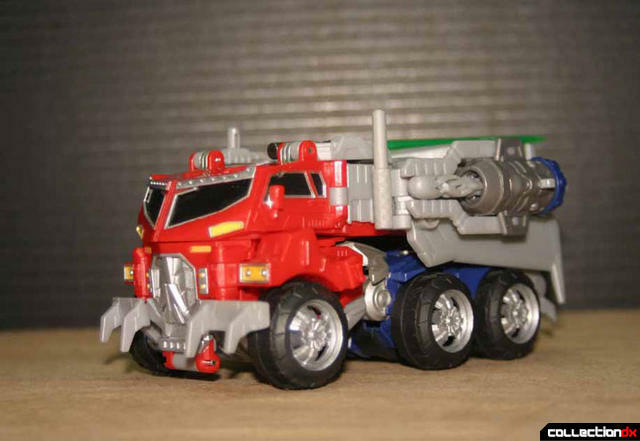 …and here I thought he looked like a cargo truck with a cowcatcher on the front. 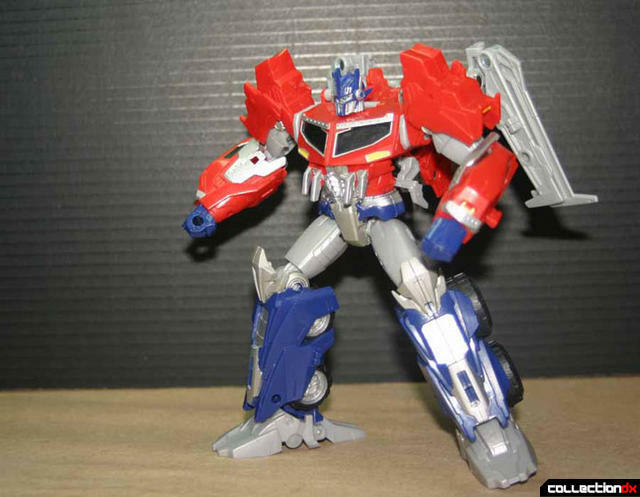 Despite his class size, transforming Optimus is very simple. 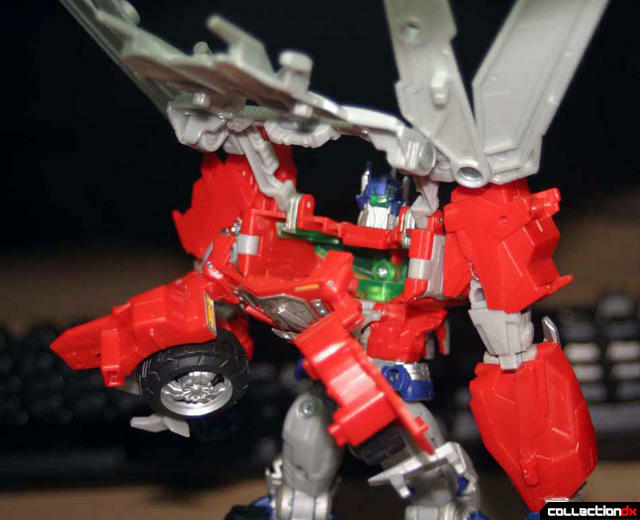 From the front and the sides, Optimus’ truck mode is very sharp looking and the figure holds itself together pretty well with very few loose hanging parts. 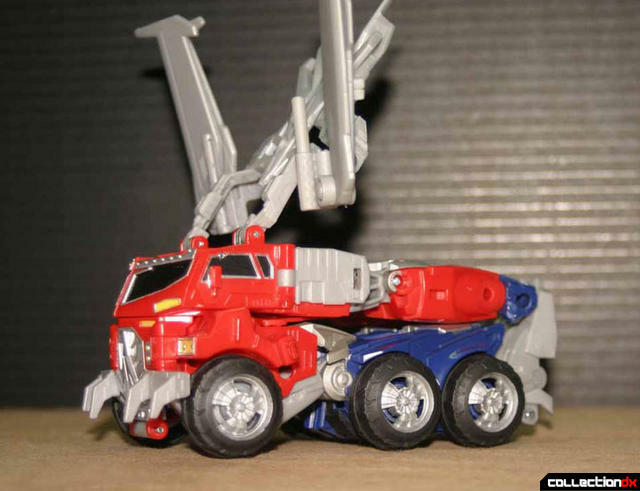 Optimus’ robot mode head is visible just behind the truck cab. 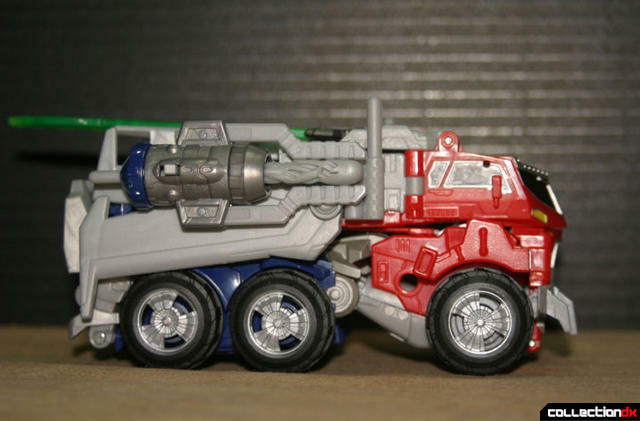 Unlike the “Prime” series Megatron whose head is clearly visible in his vehicle mode, Optimus’ head sticking out is the result of the toy design and not his character model. 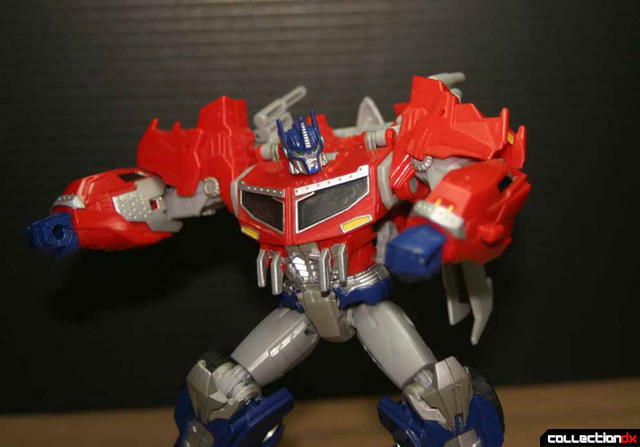 The Voyager Class Optimus Prime is a solid figure for its series, but it is far from the best thing we’ve seen out of the franchise. Not to say I did not like it, but after few hours with a paintbrush, I can say that I like it a lot more than I did. 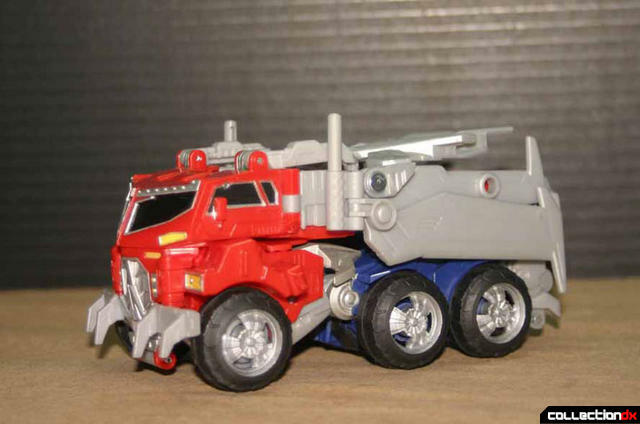 I sprung for this only with the intentions of painting it so it would look better. 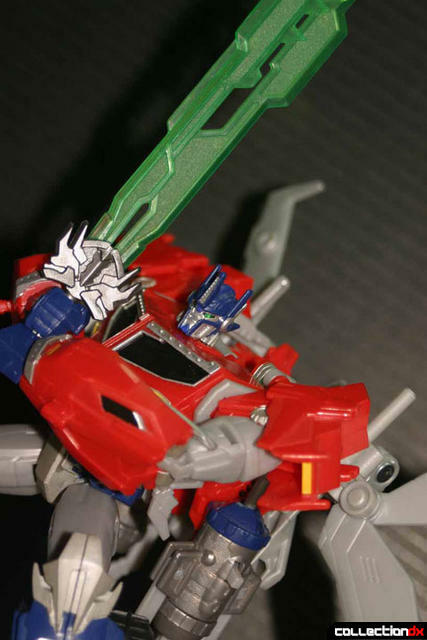 I couldnt stand the green. I popped pi s out of mine to be able to get to areas better lime the windows even though you proved it isnt necessary. 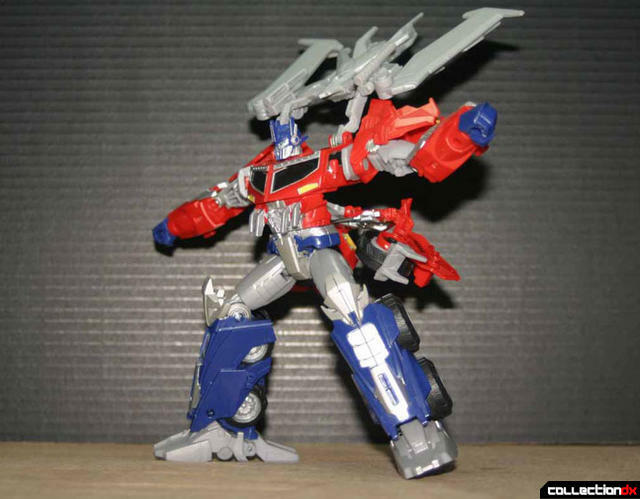 I will be doing the head i the manner u showed here too. 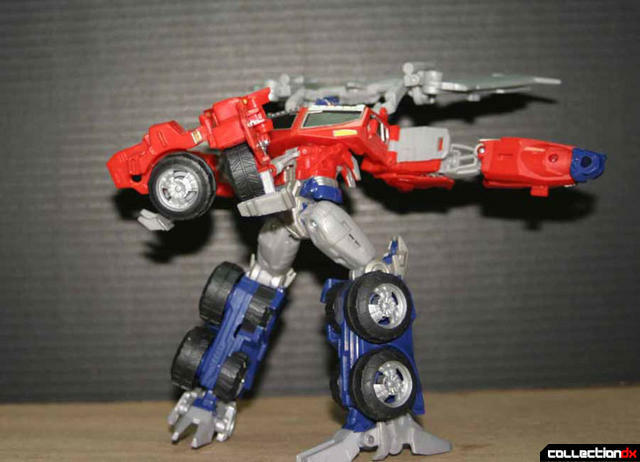 I also did the rims and inside of the leg tires. 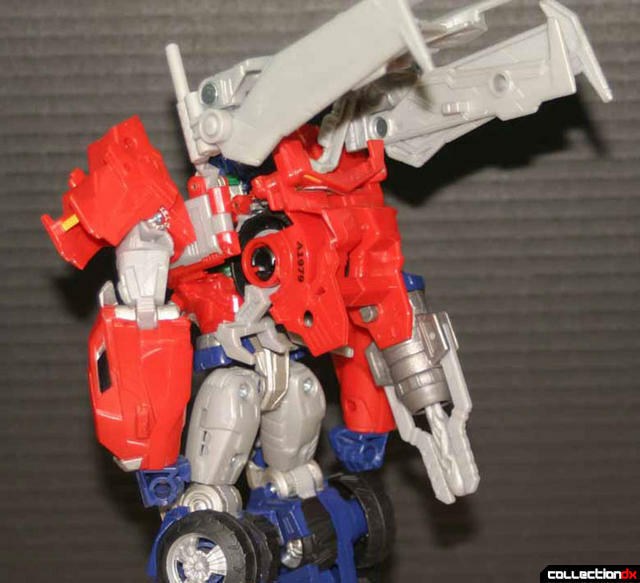 Seems that is the o ly way to make this figure really look good. 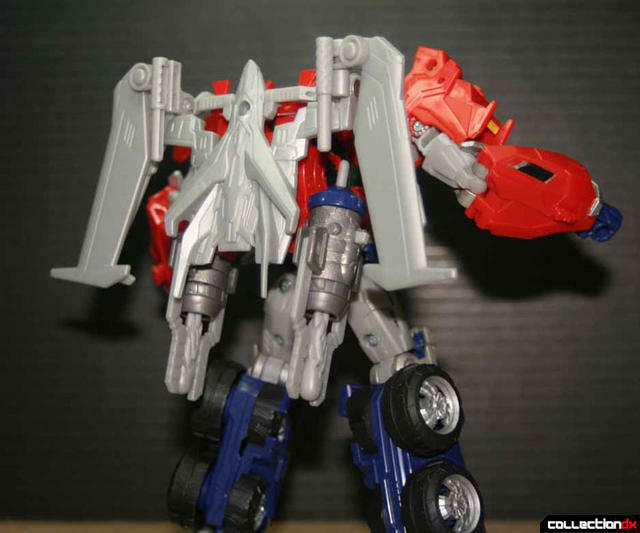 Only now am I glad I have it. Glad to get rid of the green. 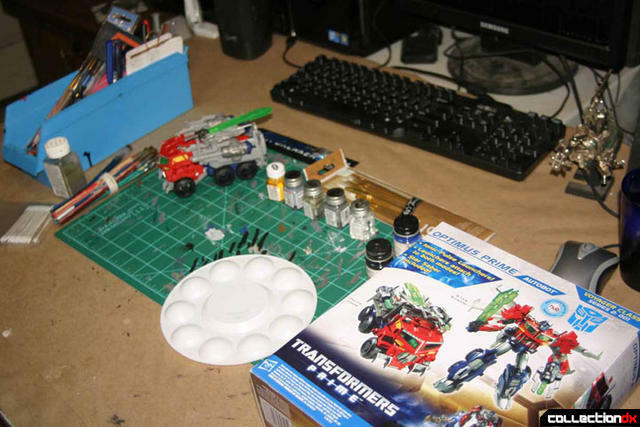 Cool review and I like how you show how to customize it!